Vegetarians, caveat emptor: This post contains a lot of meat. 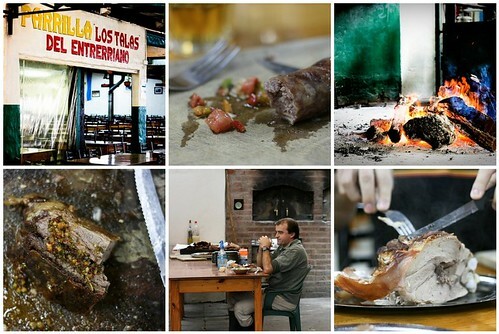 The parrilla in question was Los Talas del Entrerrianos, located about 45 minutes from our neighbourhood. Adrián arranged for a taxi to drive us there and wait while we consumed copious amounts of meat. Los Talas started out as a choripán stand for labourers and grew into a huge, comfortable restaurant that feels kind of like an Oktoberfest tent. Apparently all of the meat at Los Talas comes from their own estancia (ranch). We started with house-made chorizo sausage, then ordered the lechón, or suckling pig. It's the specialty of the house, and it was beyond delicious. We sampled some of the crispy skin of the pig (which Adrián called the "galleta" or cookie) - it was crispy and salty and very, very yummy. The chicken was the best I've had so far in Buenos Aires - cooked just perfectly to be tender and juicy all the way through. We shared an order of mochillas (sweetbreads), then moved onto the beef: vacío (flank steak) and asado. 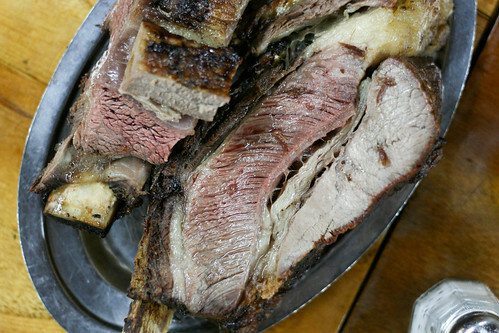 While asado refers to roasting or barbecue in general, it's also used to describe a cut of meat (short ribs or spareribs). Suffice to say we were pretty much sweating meat by the end of the meal. The ol' meat sweats didn't stop us, however, from sharing a couple of desserts, and we managed to squeeze some ice cream into our bellies somewhere between the pork and the spareribs. I swear the taxi groaned a bit when we piled back in for the drive home.